"My joining the Communist Party is a logical step in my life, my work and gives them their meaning. Through design and color, I have tried to penetrate deeper into a knowledge of the world and of men so that this knowledge might free us. In my own ways I have always said what I considered most true, most just and best and, therefore, most beautiful. But during the oppression and the insurrection I felt that that was not enough, that I had to fight now only with painting but with my whole being." 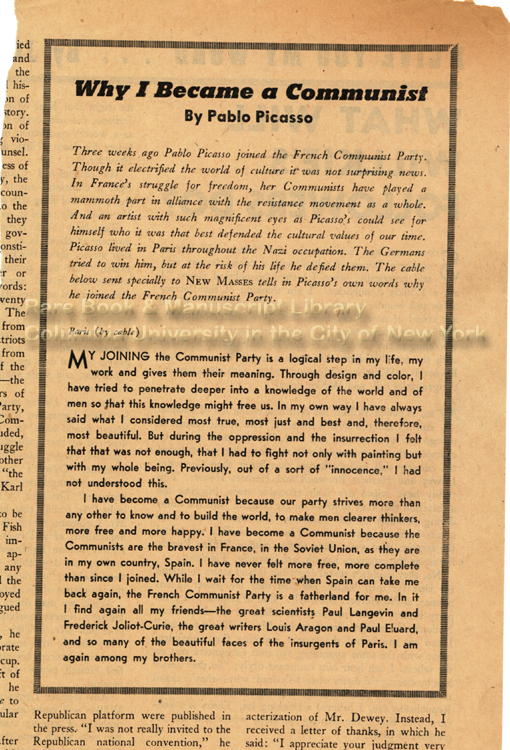 For Picasso, Communism was a means towards freedom and happiness, as he wrote in the article: "I have become a Communist because our party strives more than any other to know and to build the world, to make men clearer thinkers, more free and more happy." The year 1945 was a pivotal one for thinkers on the left, after the "Great Purge" of 1936 through 1938 in Russia by leader Joseph Stalin, many leading figures began to deflect from Communism and, like Schapiro’s friend and former Communist spy Whittaker Chambers, would altogether denounce it as a failed concept and governmental form. As Picasso’s stance suggests, many individuals in artistic and entertainment circles moved within the orbit of Communism as a liberal concept. To counter this trend, the House Committee on Un-American Activities (HUAC), presided over by the United States House of Representatives, was created in 1938 to criminalize those activities in hostile congressional hearings. Many artists who identified as Communist or were considered "Communist sympathizers," a euphemism at times for being merely progressive, were blacklisted from working, as witnessed by the "Hollywood blacklist." Individuals were monitored by federal agencies such as the FBI, which, to no surprise, kept files on individuals such as Picasso for their engagement with what HUAC deemed as "Communist activities" and/or the Communist party. 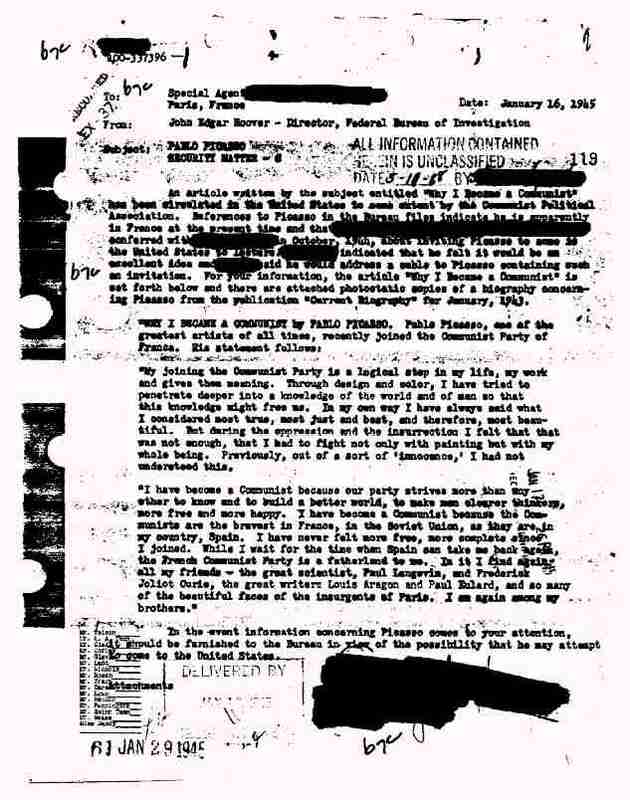 A document from the FBI archives on Picasso includes a mention of his article "Why I became a communist" and reasons that, because of this, "any information concerning Picasso" should be "furnished to the Bureau in view of the possibility that he may attempt to come to the United States." 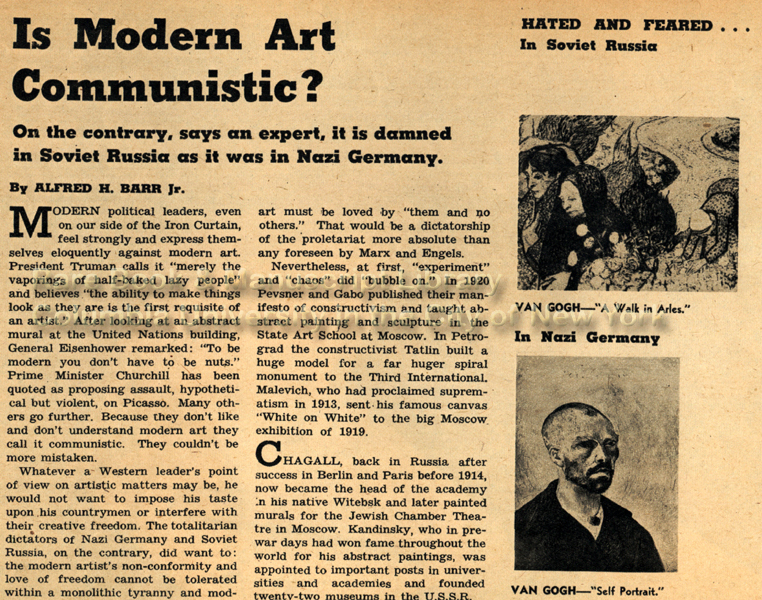 In the late 1940s to early 1950s, Museum of Modern Art director Alfred H. Barr Jr. would compare Communist Russia to Nazi Germany in his article for the New York Times Magazine titled "Is Modern Art Communistic?" Barr would write this it seems to distance and even undermine the assumption that artists, perceived as liberals, where in any way affiliated with Communism — an important distinction to be made in order to avoid more prosecution from a paranoid populace. Indeed, as the 1950s progressed, old acquaintances parted ways ideologically, as Michael Kimmage shows in his book The conservative turn: Lionel Trilling, Whittaker Chambers, and the Lessons of Anti-Communism, yet Schapiro remained friends with individuals on both sides of the ideological divide — an interesting fact that is at times forgotten. Needles to say, it was a volatile and paranoid moment in American history — one that still holds many fascinating insights into the role of politics, the arts, and how the two collide. 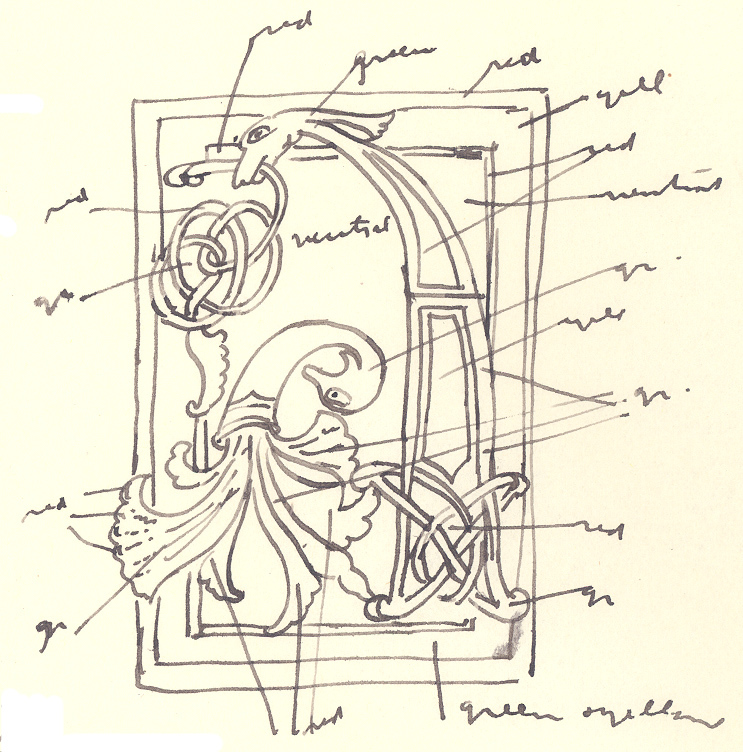 This entry was posted in Lionel Trilling, Pablo Picasso, United States. Federal Bureau of Investigation on February 24, 2010 by Administrator.